LEN - www.lankaenews.com | Crook ASP Liyanage joins Gamarala and relatives in Doha to provide ‘kavi’ singing entertainment (photos) ! Crook ASP Liyanage joins Gamarala and relatives in Doha to provide ‘kavi’ singing entertainment (photos) ! 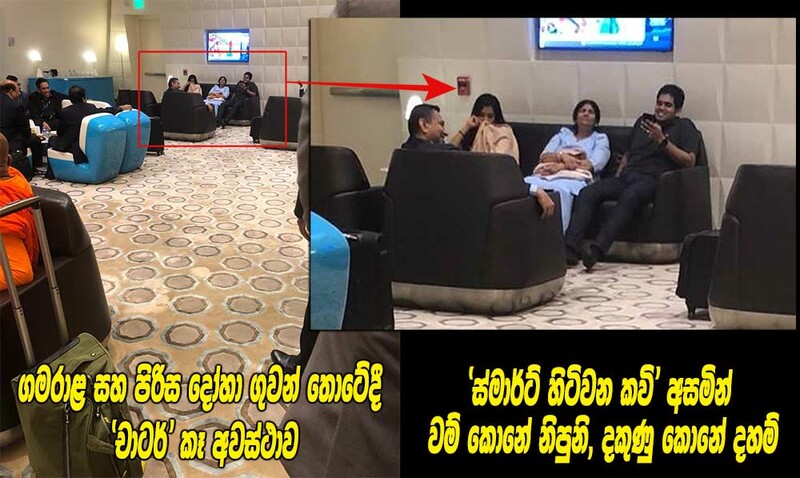 (Lanka e News – 26.Sep.2018, 10.45PM) When the notorious corrupt president Gamarala and his group of relatives were on the way to New York , before reaching New York they have been met by another moron and most notorious corrupt SL ambassador ASP Liyanage at Doha Airport . With him they have had foolish fun and frolic at the dead of night enjoying ‘kavis’ (Sinhala rhymes) . Gamarala and his entourage that left Katunayake to New York had to change the plane at the Doha airport , Qatar . This necessitated them to stay back at the Doha airport for several hours. The SL ambassador to Qatar , A. S. P. Liyanage who is best known for his corruption and stupidity had arrived at the venue to provide mirth and merriment to the other morons until they could board another plane. A woman in Qatar who is skilled in kavi recitals had been woken up at dead of night by Liyanage who is well known for his tomfoolery despite being an ambassador . He has through his mobile phone made her to sing kavis impromptu for the VIPs , enabling all the imbeciles without exception to enjoy it. Moronic president Gamarala by now better known as a ‘national liability’, and who can easily be taken for a ride had become ecstatic listening to the smart phone instantly spun kavis of the woman . The fun and frolic had gone that far this woman had sung kavis via the smart phone even to enchant the stupid relatives of the ‘national liability’. The cunning woman who knew the foolhardiness of Gamarala and his susceptibility to flattery had sung ‘smart’ instantly created kavis via the smart phone extolling him and his family. She had in her kavis sung , Daham’s wedding shall be held soon , Chaturika shall be a ‘queen’ , and Gamarala will be president as long as his life lasts . The photographs ( sent to Lanka e news ) depict Gamarala and the group at the Transit Charter bay within the Doha airport . Seated with Jayanthi Sirisena and Daham Sirisena , in the same sofa is Nipuni Weeraratne , Daham’s fiancée. Nipuni is the daughter of the businessman who owns ElCardo . It was Nipuni who hid safely the illicitly earned dollars, Sterling pounds , Indian rupees and other ‘black monies’ of Gamarala during the last presidential elections.